Simple Network Management Protocol (SNMP) is part of the IETF’s Internet Protocol suite. It is used to enable a network-attached device to be monitored, typically for centralized administrative purposes. In SNMP terminology, the Smoothwall can be regarded as a managed device when the SNMP service is enabled. The SNMP service allows all gathered management data to be queried by any SNMP-compatible NMS (Network Management System) devices, that is a member of the same SNMS community. The Community field is effectively a simple password control that enables SNMP devices sharing the same password to communicate with each other. 1. Go to the Services > SNMP > SNMP page. 3. Enter the SNMP community password into the Community text field. The default value public is the standard SNMP community. Note: To view information and statistics provided by the system's SNMP service, a third-party SNMP management tool is required. 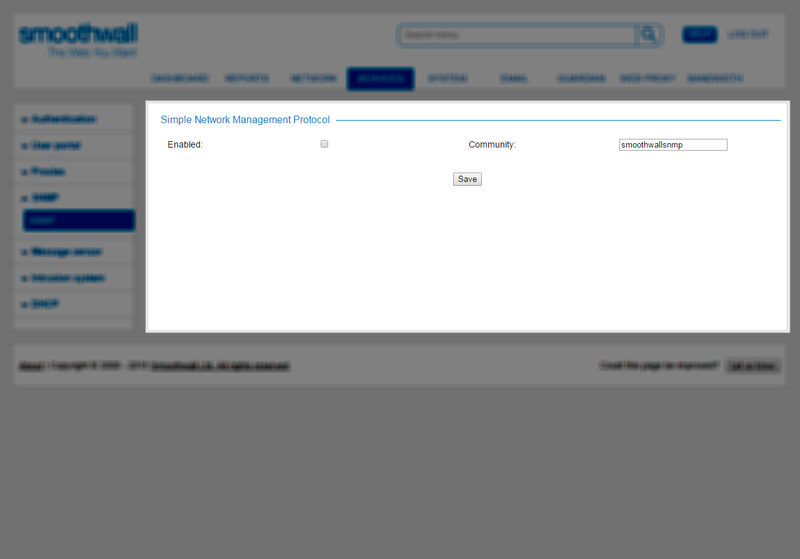 For specific details about how to view all the information made accessible by the Smoothwall’s SNMP service, refer to the product documentation that accompanies your preferred SNMP management tool. Note: To access the SNMP service, remote access permissions for the SNMP service must be configured. For further information, see Configuring External Access Rules.